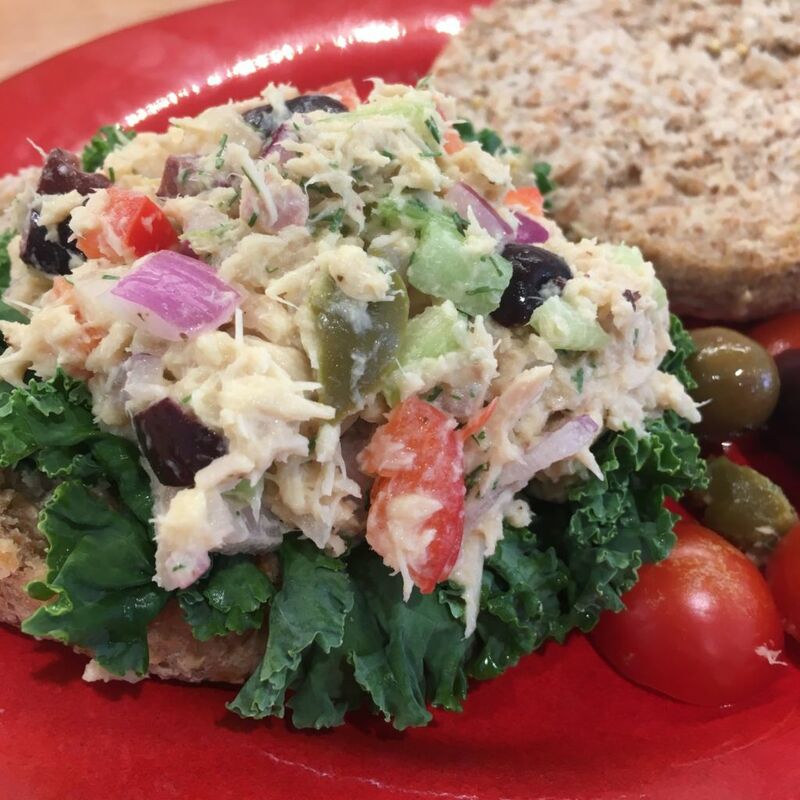 Zingy tuna salad packs lots of nutrients, flavor and texture: lemon, raw crushed garlic, dill, favorite mustard, hummus, red wine vinegar, olive oil, chopped olives, red onion, celery, and red bell pepper. Raw garlic is so good for you! And this recipe is one delicious way to incorporate it into your cuisine. Don’t be shy! If my 1-year-old can do it, you can too. After his first bite of this dish, my 1-year-old signed “more,” for another, and another, until he and I polished off the entire batch in one sitting. Serve atop a leaf of kale or lettuce on a flourless sprouted grain English muffin (often found in freezer of health food section). I enjoyed your appearances (both of you!) on npr today, esp since nutrition, natural health,drugfree living,longevity,travel,the far east, etc-etc, have been among my interests since 1958,when a friend lent me Let’s Eat Right to Keep Fit, by Adelle Davis, who would have made many changes were she still with us, of course. Question: This tuna recipe piques my curiosity about protein and carbohydrate grams per serving. I am 80 now, going on 50,living independently. I do eat often to stave off hypoglycemia. Thank you so much. Btw the photos show a lovely family. Mine too — 3 sons, 6 grands. I am a widow twice. Thank you so much for listening to us on NPR! I love your approach to life! I wish we had the protein/carb grams per serving for this recipe. However, with 4 small children and busy careers we are unable to compile the nutritional info per serving in the posts. Our goal is to someday be in a position where we can hire an assistant to help us with things like this. To find out the nutritional info of anything I eat I like to use either one of the following two apps. Both have a free version and both have a web based option if you don’t want to do it on your smartphone.